So... it's Christmas by myself. Simon is in Perth, visiting family. Thanks to work, I have to remain in Melbourne. Curses! Not to worry, though, we already had a mini celebration before he flew off. 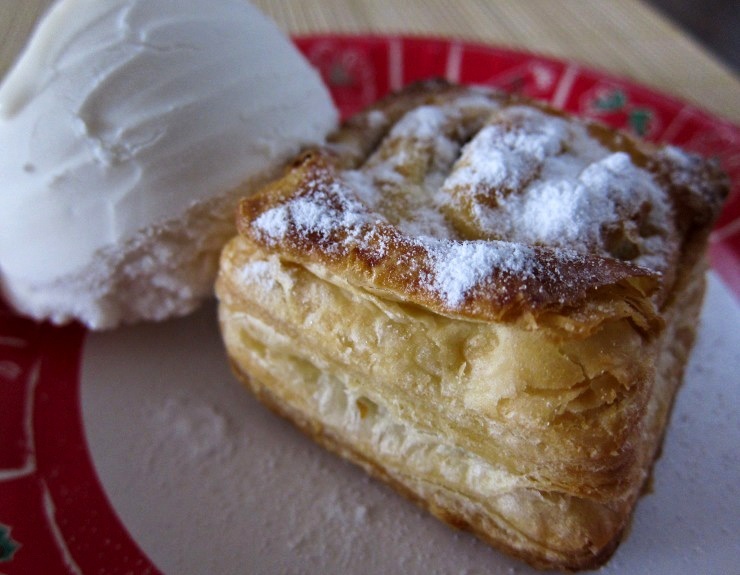 A very small affair, just the two of us, with puff pastry mince pies and vanilla ice cream. puff pastry mince pies with pine sugar, by Heston Blumenthal for Waitrose. The mince pies are by Heston for Waitrose, and they got into my radar thanks to Sarah's tweets about them. I promptly found them stocked at my local Coles supermarket and bought a box to try. On the packaging it says, "The magic of these mince pies is the rich mincemeat, which incorporates apple puree, lemon curd and rose water. Warm in the oven and then sprinkle with pine sugar for a real festive twist." While it wasn't as luxuriously complex as I imagined (based on that description), they were still scrumptious and quite the treat - especially with that delightfully flaky puff pastry and the intriguing pine-infused sugar. We polished it all off in no time at all. On Christmas Eve, I worked overtime and on my way home, I popped in to my local Chinese, Pacific Seafood BBQ House (210 Toorak Road, South Yarra) and treated myself to takeaway. Hello, roast duck on rice! 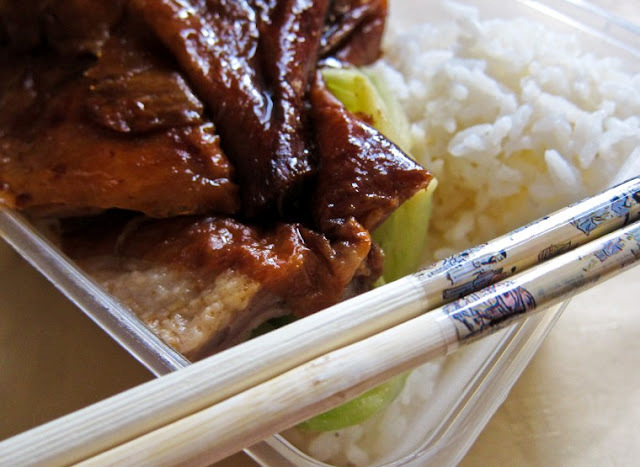 takeaway - roast duck on rice, from Pacific Seafood BBQ House. And that's about it for my Christmas celebrations. It's Christmas evening as I post this, and I haven't really done much today, but it has been peaceful and relaxing. And Simon will be back in a few days, hurrah! Sometimes so "me" time might do you a world of good and the celebrations may be even more joyous when he comes back. I love Chinese roast duck but I always prefer to eat it with the HK style noodles. Merry Christmas and have a great 2013! Chinese roast duck sounds like my idea of heaven for Christmas! Merry Christmas! I agree with the others, sometimes a few days alone is the best gift to recharge and renew. All the best to you and yours! Thank you, and Merry Christmas and all the best to you, too! I also wanted to try Heston's mince pies but left it too late and my local Coles had sold out :( Next year! Merry Christmas! Awwwww, better luck next time! Merry Christmas! Merry xmas leaf. Bummer you had to work overtime on xmas eve. I feel your pain, I'm working over this holiday season as well =(. At least this means we can have holidays sometime in 2013! oooh, still gotta bag myself some of those puffy mince pies. Ha thanks, I'll try my best. Merry Christmas! I'm sorry you were stuck working during Christmas - hopefully you enjoyed your quiet time and delicious looking duck though. Happy New Year! Hope you had a great Christmas! The plus side of being by yourself is baking alone. I love it! I absolutely adore low key Christmasses - relaxing, good food at home, that's my idea of a good time :D the puff pastries and the duck looks fantastic! Merry Christmas Leaf and Simon :) A shame that you couldn't go to Perth with him >_< Damn work but I think Low Key Christmas are also good, to just relax and spend quality time with each other ~ A shame that you didn't like the Heston mince pies as much, because I loved them and had like 3 in one sitting hahaha oops! Initially I thought mince pie means a savory meat pie then I was about to fascinate about a sugar-coated puff pastry mince(meat) pie! I keep hearing about those mince pies, they look so good! Happy New Year! oh how annoying you were apart at Christmas. I thought the mince pies were overrated. I finally tried one earlier this week, I was impressed with the pastry after it had been in the oven for a packet job. Still not bad for premade ones though! Pine sugar! That sounds really yummy. Last year it was me who spent Christmas without my family... and this year it was you. Oh well, here's to delicious takeout and peaceful time alone! Sounds better than my Christmas! I spent 13 hours on the plane back with the Boy from Spain! Hahaha.. it was a tiring christmas!